Woah! 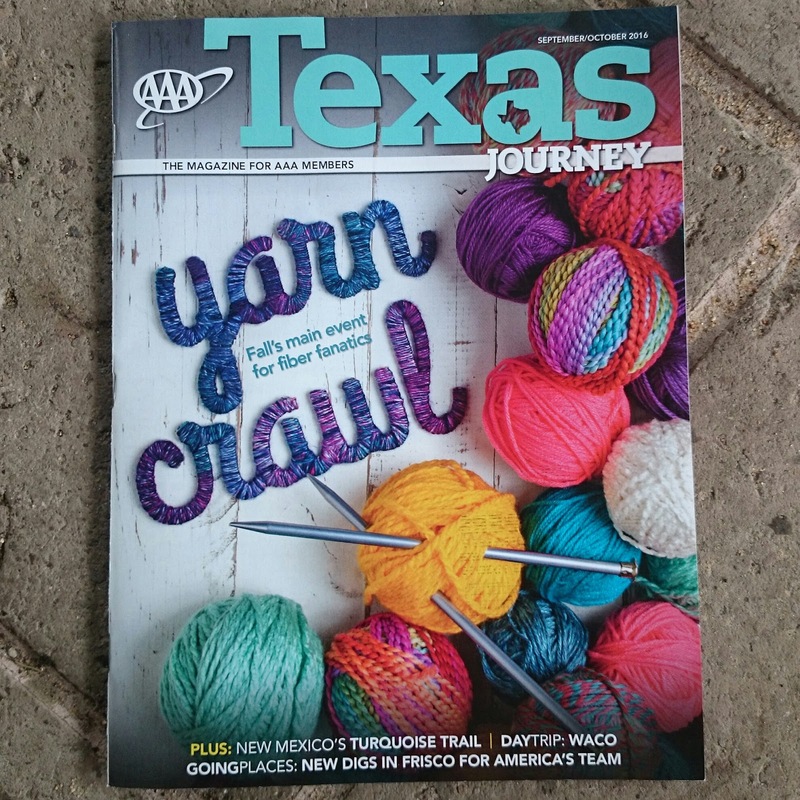 Look what arrived in our post this week - a yarn crawl on the front cover of our AAA members magazine (that's breakdown cover). Fantastic! My husband commented "I can't escape!" The 10th annual Hill Country Yarn Crawl takes place at 19 different yarn stores in Central Texas from October 7th-16th. I really need to start planning how I can get myself along to at least a small part of the action. I have never been on a yarn crawl before but according the website it works as follows: purchase a Yarn Crawl passport for $15 either on the website or at a participating yarn store. With this you receive a commemorative stitch marker (and bag for the first 1000 participants), two exclusive patterns at each store you visit and a 25% discount on the yarns for those patterns. There are prizes and the more stamps you collect (one per store) the more opportunities you will have to win. And if you're on Instagram there are prizes for those posting photos with the hashtags #hcyc2016 and #crawlhawl16 I love it! I am excited about seeing many of the lovely folk that I met at the Houston Fiber Fest in June this year. Independence Farmstead Fibers are offering private tours of their mill for the first time to the crawlers this year. WC Mercantile will be hosting Blue Bonnet Alpaca Ranch both weekends of the Crawl. You know I can't get enough of alpacas and Navasota just happens to be my closest stop. Anyway do head over to Hill Country Yarn Crawl website for more details. There is also a Yarn Crawl Facebook page. I just checked out the hashtag #hcyc2016 on Instagram and the stitch marker looks amazing. I can't wait for mine to arrive! And there are already lovely photos of the mystery knit along and crochet along on there. I have just bought the latter and will be playing catch up!! Enjoy the yarn crawl y'all! There's always yarny fun to be had Jodie. So distracting!! We've been trying to figure out how many we can actually go to and we're thinking a maximum of three on two days!! Texas is a BIG place. We will enjoy the stores we can go too.